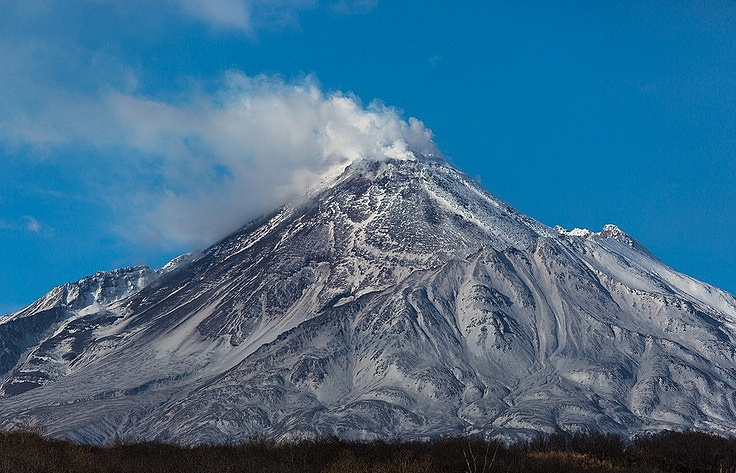 The Bezymianny volcano in Kamchatka has spewed up ash as high as 17 km above sea level, subsequently sparking a new eruption, the third this year, the Kamchatka Branch of the Geophysical Service at the Russian Academy of Sciences (RAS) told TASS on Wednesday. "The Bezymianny volcano has belched ash 15-17 km above sea level. A rash of seismic activity was detected on December 18. Hot ash tumbled down the mountain's southeastern slope, the number of volcanic events surged, and steam ejections became more intensive. Bezymianny started a new eruption today," the source said. The ash is being blown in a northeastward direction. Bezymianny is one of the Earth's most active volcanoes. It erupted twice in 2017 - once in March and again in June. It is located in the central part of the Klyuchevskaya cluster of volcanoes, 350 km to the northeast of Petropavlovsk-Kamchatsky and 40 km from the villages of Kozyrevsk and Klyuchi in the Kamchatka Region. According to measurements, the volcano is 2,882 meters high. Bezymianny burst back to life in 1955 after nearly 1,000 years of dormancy, and the first outburst occurred on March 30, 1956. Since then, the volcano has become 200 meters lower. It belched about three cubic kilometers of volcanic products in a short period of time, with its column of ash reaching about 35 km above sea level. Scientists detected 44 strong explosive eruptions from 1965 to 2012. The volcano has been monitored daily since 1993.